Abstract: American Express has always been at the cutting-edge of analytics and decision science. Today, our cutting-edge Machine learning and Artificial Intelligence capabilities are critical to driving decisions that better serve Card Members and grow the business. If selected, Alexander could inform attendees about how the company is leveraging machine learning models across the business to provide accurate credit assessments and industry-leading fraud prevention. Bio: Alexander Statnikov is Vice President of Digital Modeling and Machine Learning at American Express. He plays an essential role in leading Machine Learning and Big Data Analytics activities for the company. Alexander is currently managing teams of data scientists responsible for developing a variety of machine learning models and data products for customer acquisition, underwriting, credit and fraud management. 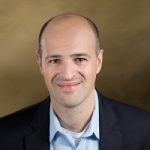 Prior to joining American Express, Alexander was an Associate Professor at New York University specializing in causal discovery and various areas of data science and machine learning. Alexander is an author of more than 50 journal articles, 5 books and monographs, and inventor of 13 U.S. patents (issued or pending).